Here’s a tutorial for you today! 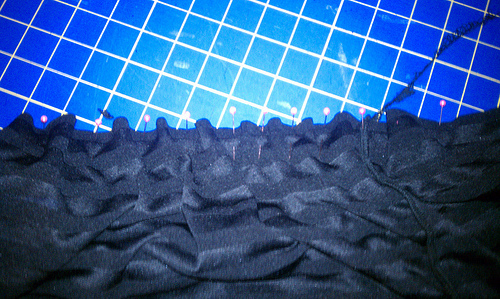 I had a little bit of ruffle fabric leftover from Zoe’s skirt. I’ve been trying to slowly build up some doll clothes for her birthday this fall. Shhhhhhhh! Don’t tell! Now that the kids are back in school, it’s much easier to borrow one of Zoe’s dolls. Julie was nice enough to get up from nap to help me out. 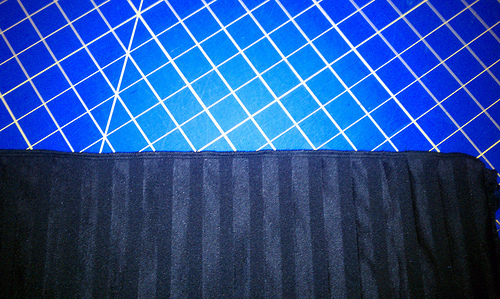 one piece of cotton/lycra knit 10″ x 1.5″ for the waistband – it should stretch the long way! 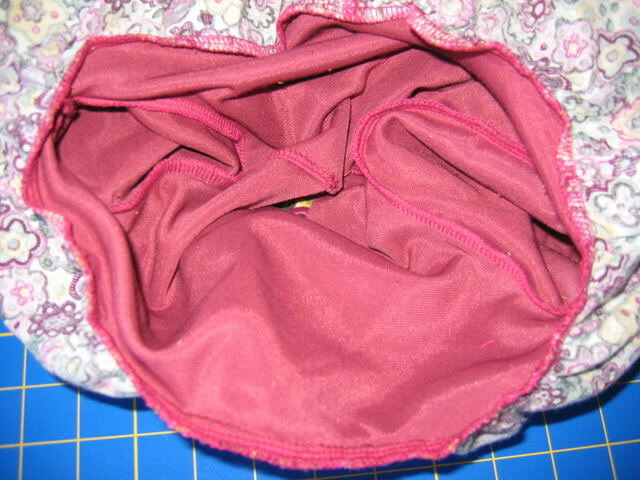 Fold waistband right sides together so it is 5″x1.5″ when folded. Stitch ends together. 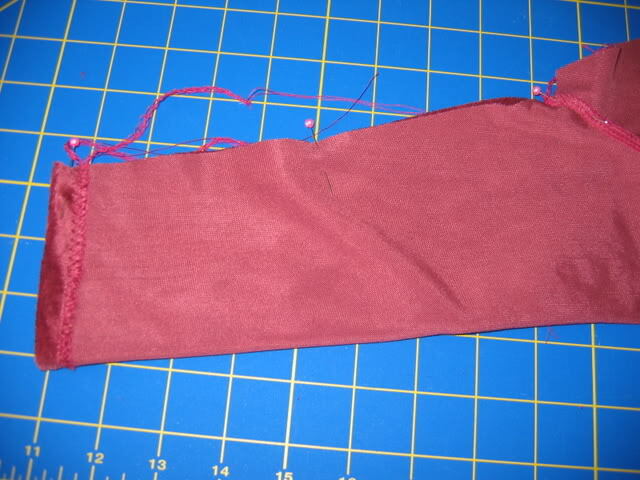 Fold waistband wrong sides together the short way and mark the quarter points. I just pin them, you could also use your marking pen. 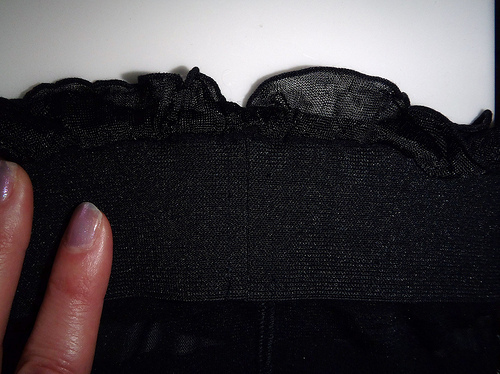 Once you have cut your ruffle fabric, use your Wonder Tape to help line up the rows of ruffles. Carefully place it on one side. Make sure the ruffles on the opposite side are lined up with the edge. Then carefully pull the paper off the Wonder Tape. Pick up the side of the fabric with the Wonder Tape on it. Holding it taut, match it to the other side, right sides together. After it is nice and stuck together, flip it over to check that everything is smooth on both sides. 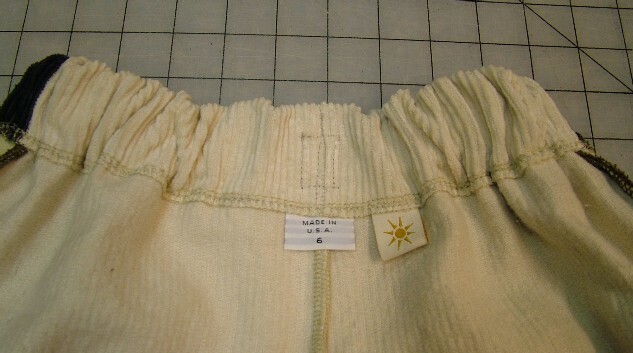 Peek inside the fabric tube to make sure all the ruffles stayed the way they were supposed to. Now that it’s nice and stuck together, sew the seam. 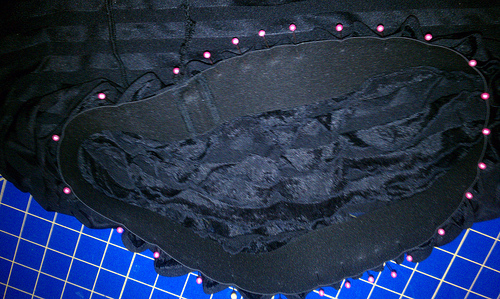 Leave the ruffle fabric right sides together for now. Find the quarter points on the top of the ruffle fabric tube you’ve just created. 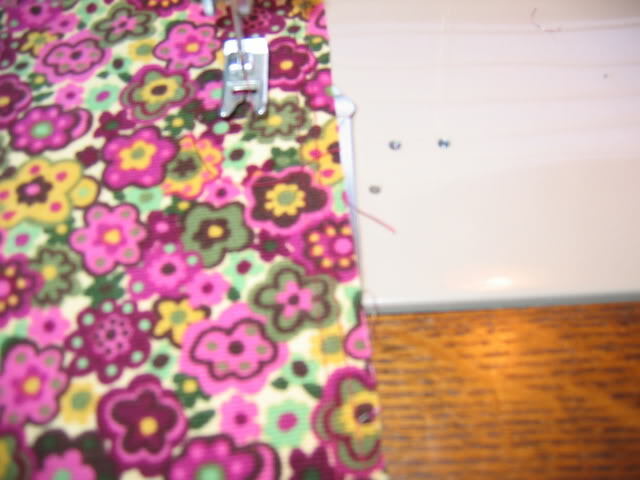 Match up the quarter points on the waistband to the quarter points on the skirt and pin. 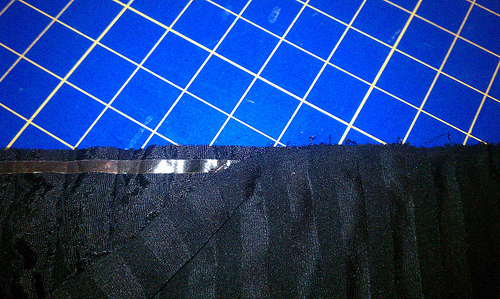 Sew the skirt and waistband together, stretching the waistband to fit the skirt. That’s it! Julie looks excited about it, doesn’t she? Hopefully Julie can keep a secret. We have to put this away until Zoe’s birthday. 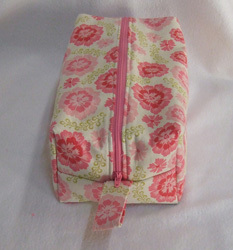 Today’s tutorial was created by Mel, aka SewingMel, who can also be found blogging at Sewingmel. Thanks, Mel! 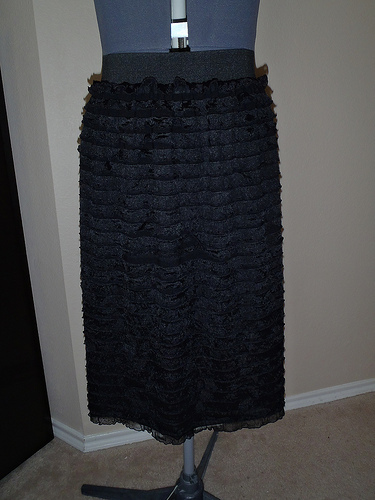 This skirt is made based on your measurements, and it can be made for kids or adults. Ruffle fabric can be a bit bothersome, but Mel has documented some tips that made it easier to sew. Cut your fabric length. 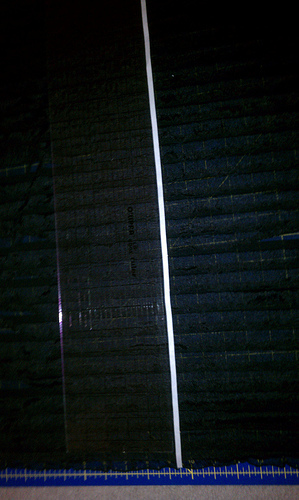 My fabric was 24″ long. 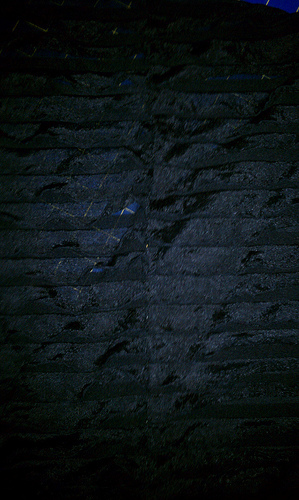 You will cut the bottom layer under the ruffle so that you can’t see the raw edge. There is no need to finish this edge. 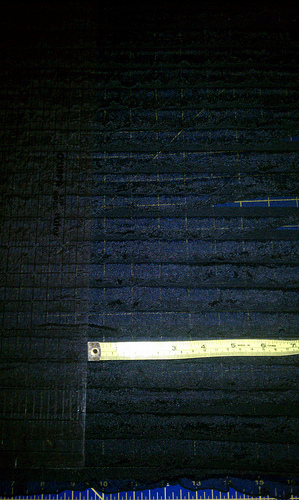 Measure the width of your fabric. My width was my hip measurement +5 inches. It really helps to do this on a rotary mat so that you can make sure that all of your lines are straight. 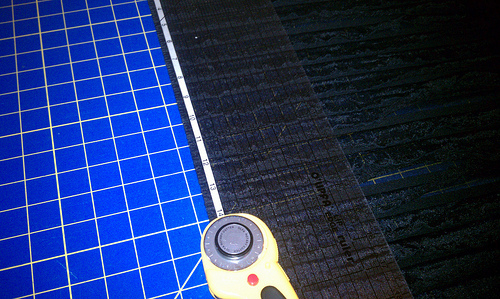 Place an acrylic ruler (or yardstick) where you want to cut your width. Place a line of Wondertape against the edge of the ruler. Your line should be perpendicular to your ruffle lines. This is why it helps to do this on a lined mat. Do NOT remove the paper backing! 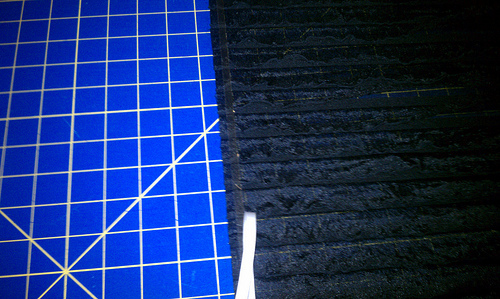 Place your acrylic ruler 1/4″ away from the Wondertape line, and cut using your rotary cutter. I now had my hip measurement +5 inches + 1/4 inch. Carefully removed the paper backing of the Wondertape. If the tape starts to come up with the paper, carefully put the paper back and press the tape onto the fabric before continuing to remove the paper backing. Match your raw edge ruffles. Make sure that the fabric is smooth when you place it on the Wondertape. Picture is turned. 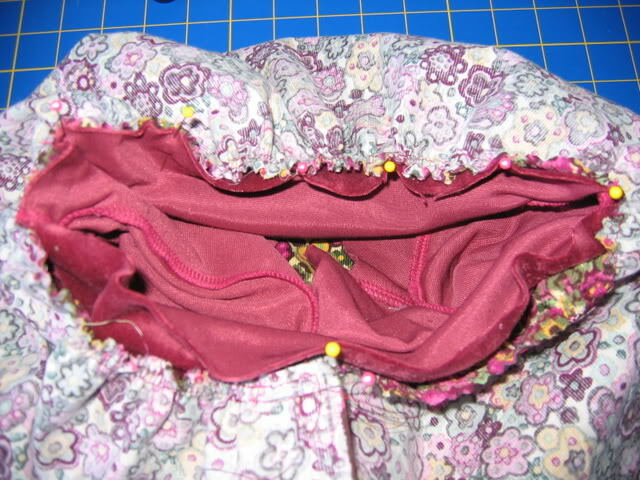 Turn fabric over to check that ruffles are smooth. 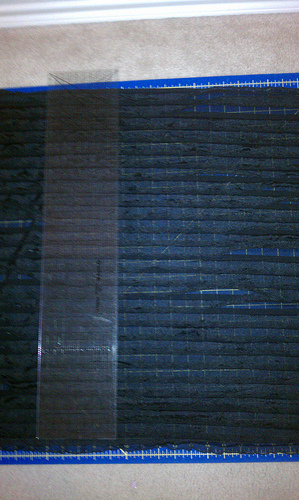 The Wondertape will hold the fabric in place. If fabric is not lined up, carefully adjust fabric. 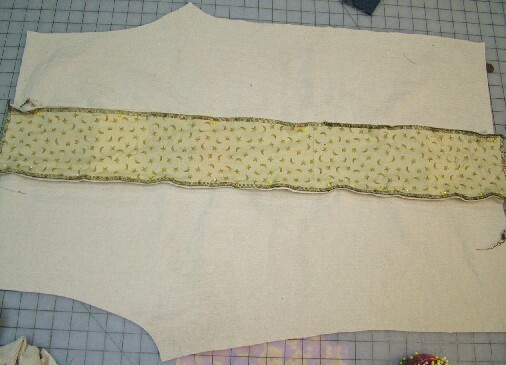 Make waistband by measuring your waist where you like to wear your waistband using your unstretched elastic. Now, pull it tight by 2-3 inches, and cut elastic. 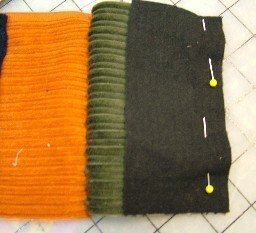 Serge or zig-zag elastic ends before sewing ends together using a 1/2″ seam allowance. 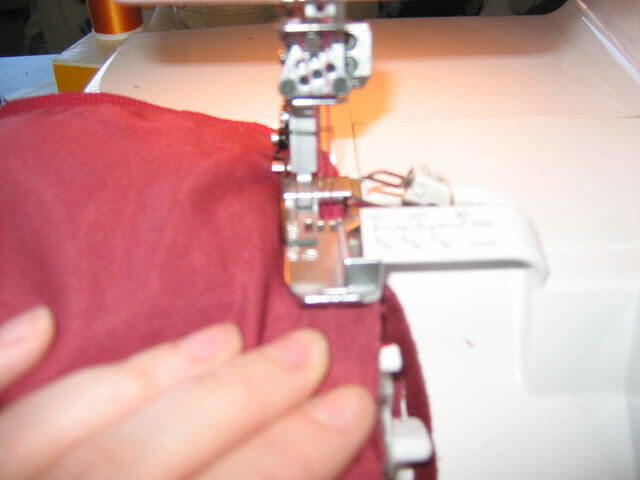 Find, match and pin the quarter points on the skirt and waistband, starting with the center back seam of elastic and center seam on skirt (right sides together). Place the waistband and fabric around your legs, right sides together (non-seamed side of elastic is touching the pretty ruffled side). 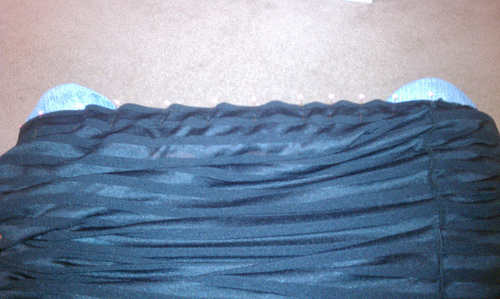 Stretching just the elastic waistband (it is best to wear jeans for this), match skirt fabric to waistband. Pin every 1.5-2 inches. 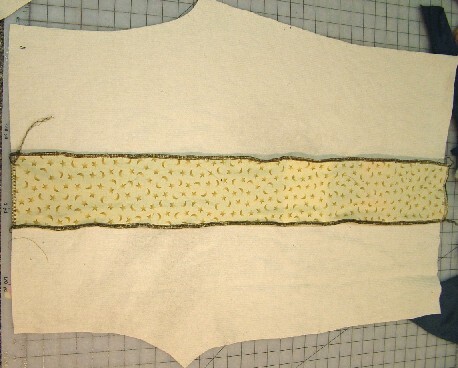 Stretching just the elastic waistband to meet the fabric, slowly serge or zig-zag waistband. Do NOT sew over pins. Take your time! Turn out, and you are finished! Thanks, Mel! Happy Sewing Everyone! How are you doing with these monthly challenges? June – Make it Sew Organized! Use your sewing skills to organize your space or yourself! There’s plenty of room for creativity in the interpretation of this one. Perhaps you could use a fabric bowl (check the tute!) to hold the keys in your kitchen? Or the assortment of hair ties in your bathroom? Maybe a place to toss the collection of remotes in the family room? Or maybe you need a bag to collect all your library books? Perhaps you need a travel bag (check the tute!) to collect all your cosmetics and toiletries before your next trip or just to contain them in your cupboard? Maybe you need a needle roll to organize your knitting needles? Or a crayon roll to contain the crayons so you don’t find them melting under (or on!) the car seats this summer? Maybe your sewing space would be a bit more organized with a new pin cushion made to match your room, or made in a favorite color or print that you’ve been hoarding the last scraps of? Whatever your organizational need is, use your sewing skills to get it done! And, the June Christmas Challenge! Seasonal placemats or napkins ~ Make these as simple or complex as you like. Remember those huge holiday prints you thought were so fun at the fabric store and then realized they didn’t really go with anything? They are great for the kids’ placemats or napkins! Perhaps you want the simple elegance of a solid with a tidy rolled hem? If it works for you, it works! Just have fun creating something you will use next winter! 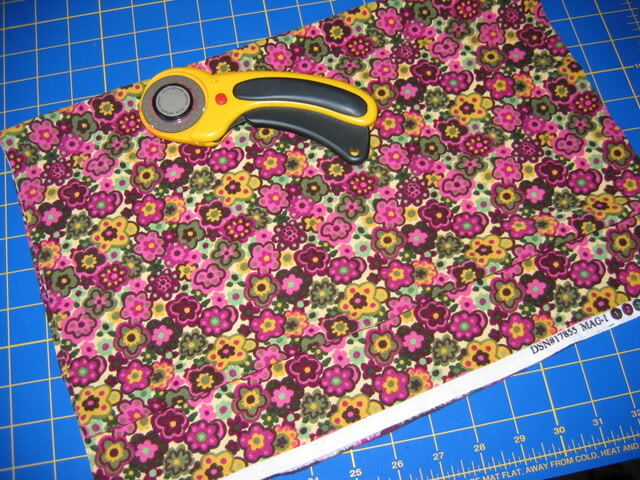 This tutorial was created for Sewing Mamas by sewingmel, who can be found blogging here. Adjust your favorite t-shirt pattern. Mine is Ottobre 4/04 #36. If you don’t have this issue, please buy it today! It is so worth it! A: Draw a line from the underarm seam to the center of your shirt. I drew it slightly sloping down, but you can go straight across if you like. This is the dotted line in the picture below step B. 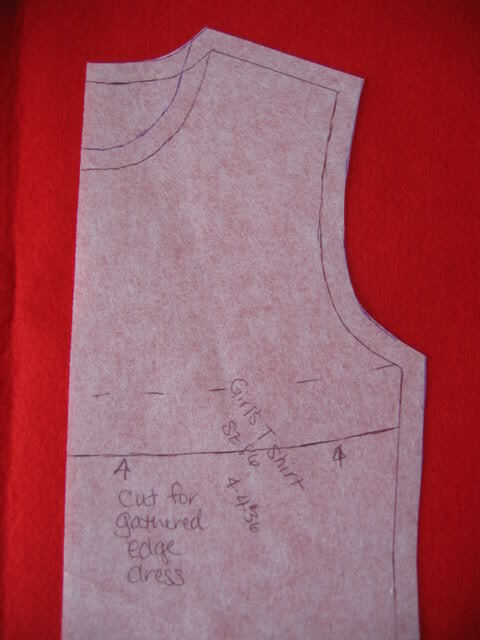 B: Draw a solid cutting/folding line as far away from the dotted line as you like. I just did a 1" line this time, but I do 2-3" for bigger sizes. Cut out front, back, and sleeves. 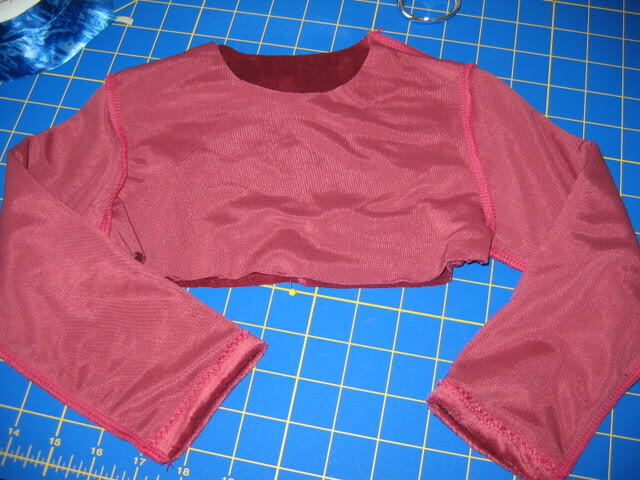 This can be done with long sleeves, short sleeves, or no sleeves (you would need foe for the armholes). Sew up shoulders, and attach sleeves. Pretend that you are sewing up a regular t-shirt for now. Finish sleeve hems any way you like. I just folded under and used a zig-zag stitch. 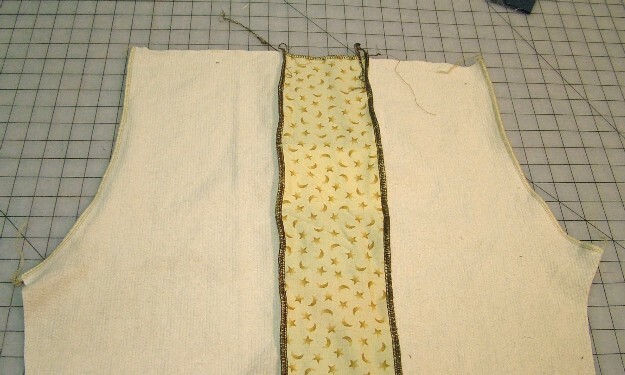 You could also coverstitch, use a rolled hem, use trim, or use foe. The choice is yours! Be creative! Pin each arm and underarm together. 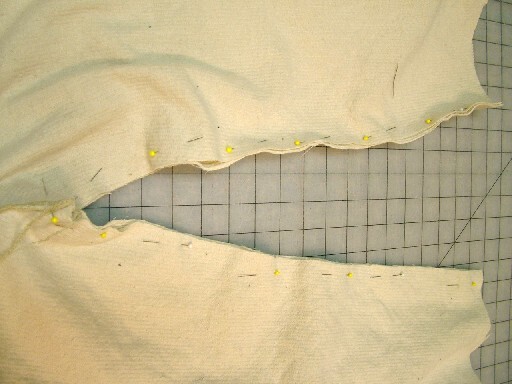 Sew last seam in shirt. Decide how long you want to make your skirt. I made mine 16 inches for a 2T/86. 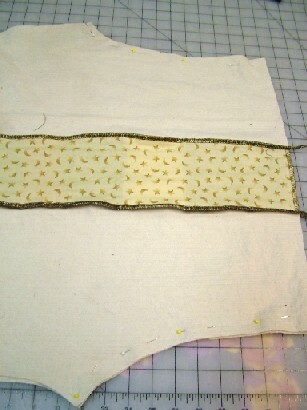 Cut a long rectangle the width of your fabric (if woven) or about double the width of your waist by your desired length. 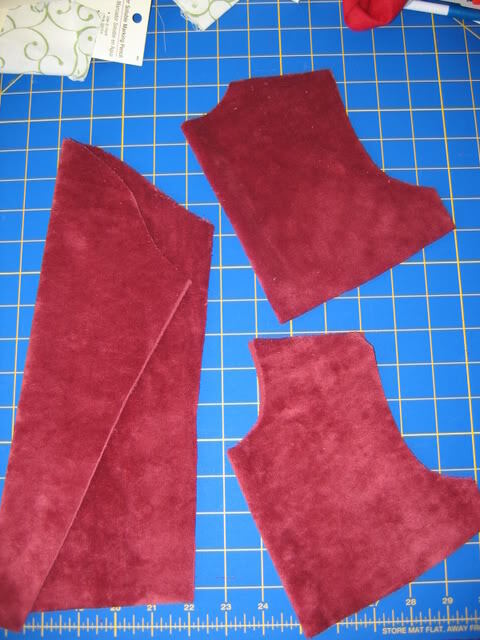 If you are making a much larger dress, you may need 2 lengths of fabric for the skirt. Finish your hem any way you like. See step 4. I turned mine under 1/4" and again at 1". Step 8: Please remember this step! I always forget it! Mark your four equal parts (front, sides, and back). Your back seam is not finished at this point. 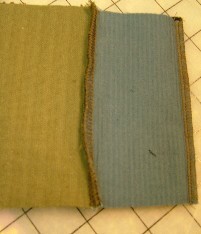 I kept in mind that I would use 1/2" seam to take care of the selvage I did not cut off. Sew 2 gathering lines about 1/4" apart along top edge of fabric. (Pay no attention to the presser foot. 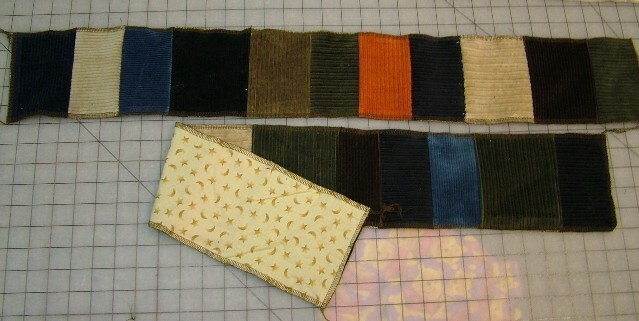 The stitches are on the far right.) Gather up skirt. 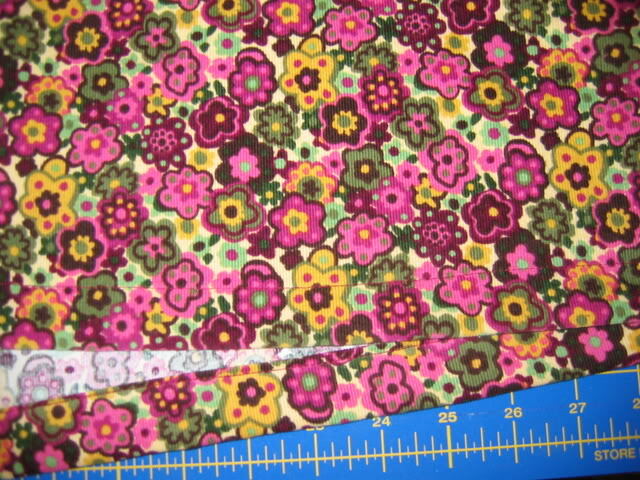 Match up midpoints of skirt and shirt and pin fabric right sides together. 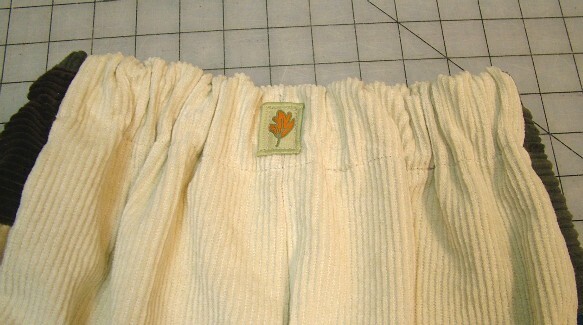 Sew back seam shut. 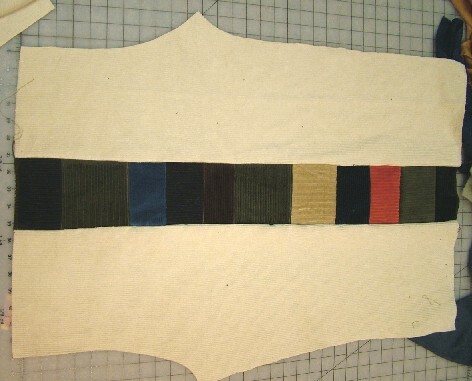 Finish neckline with foe, binding, or ribbing. I chose foe. Today we are digging wayyyyy back into the Sewing Mamas forums for this fantastic tutorial to make patchy side panel pants. 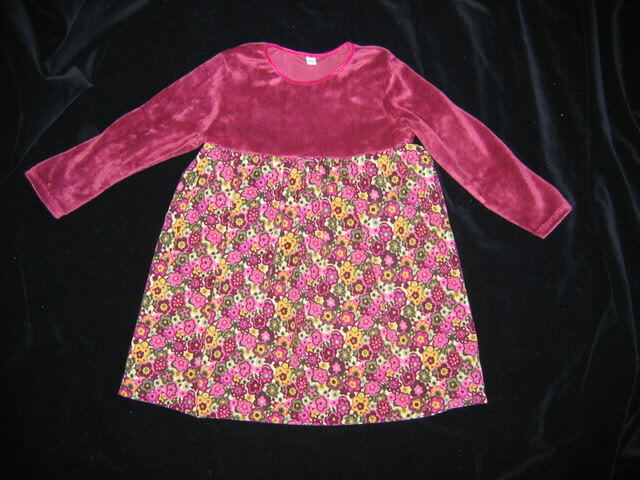 This tutorial was created by Tara for Sewing Mamas back in 2005. Start with your scrap basket and find scraps that are at least 5″ wide and 3″ tall. 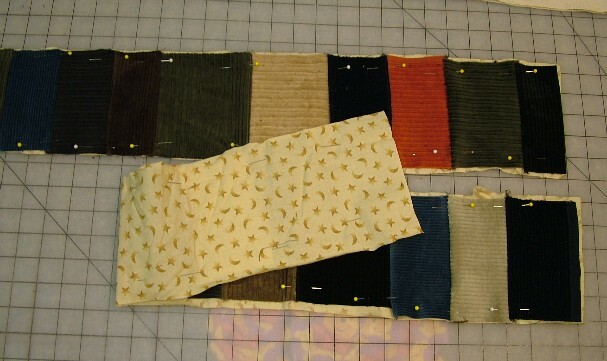 All of them should be cut to 5″ wide, but the height can vary if you want the side panels to have different sized patchwork. I cut mine 3″-5″ tall. Then, line them up in the order you’d like them to be, from top to bottom, and serge them together. I do pin mine before serging–I’m a pin freak. 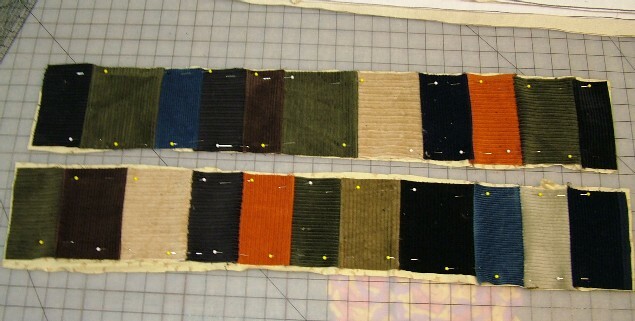 You need to make two strips of patchwork; one for each side of the pants. 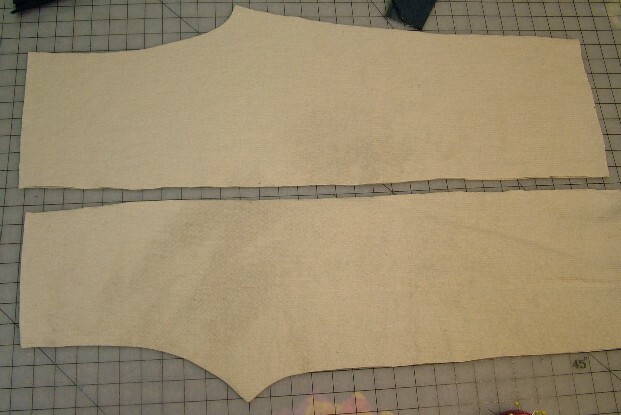 Once you have serged all of the scraps together for the side panels, measure them and make sure each side panel is at least as long as the outseam measurement of your pants pattern. 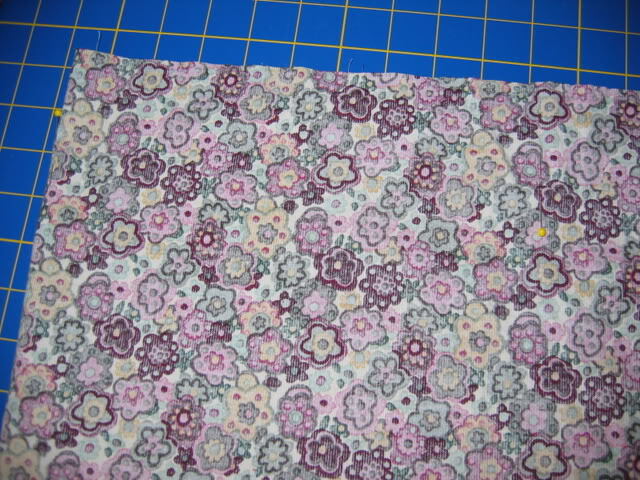 Take the coordinating fabric and cut two long rectangular pieces to fit each strip of patchwork. 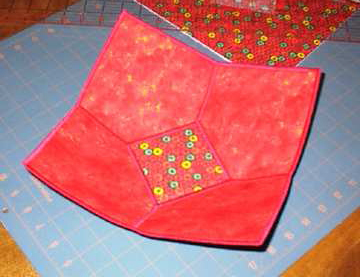 Pin and serge around all 4 edges for each side panel. 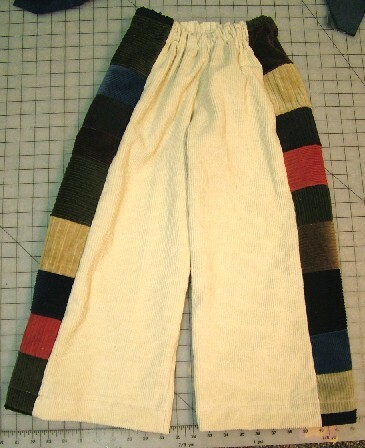 Set aside the patchwork panels, and cut out the pants. I used medium-wale hemp/cotton cord which I coffee-dyed last night. It’s a little darker than the original natural color. Some people take in the width of each of the pieces when they are cutting them, but I like the pants nice and full, so I cut out the pattern without any changes. Take one patchy side panel, one front pants piece, and one back pants piece. 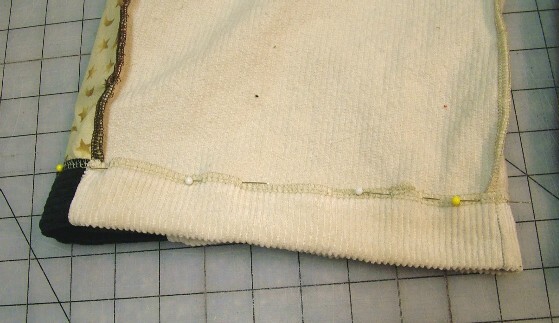 Pin one side of the side panel to the outseam of the front pants piece. 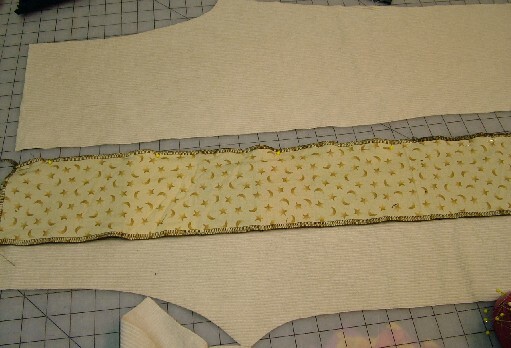 Pin the other side of the side panel to the outseam of the back pants piece. Serge along where you have pinned, attaching the side panel to the outseams of the front and back pants pieces. 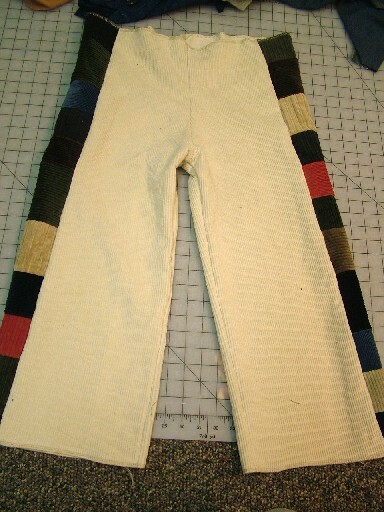 Right sides together, pin the front and back rises of the pants. Serge the rise from back to front. Open up the pants so that you can pin the inseam from ankle to ankle, making sure you match the crotch points exactly. At this point, I have also serged around the waist and around each ankle hem to finish the fabric and keep it from fraying. Turn inside out. Turn waist over about 1″ (or enough to accommodate the width of your elastic), pin, and stitch, leaving enough of an opening to feed the elastic (which is shown here with a big safety pin). I’ve also added a size tag and a decorative sun tag. 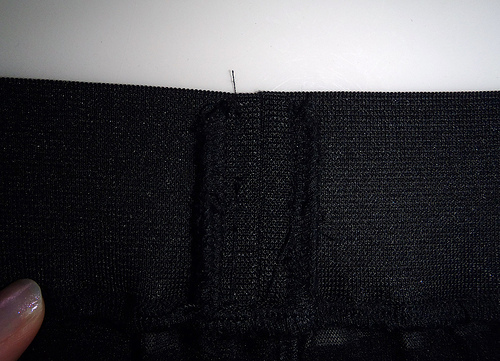 After you feed the elastic all the way through, overlap the edges of the elastic slightly and stitch to attach them. 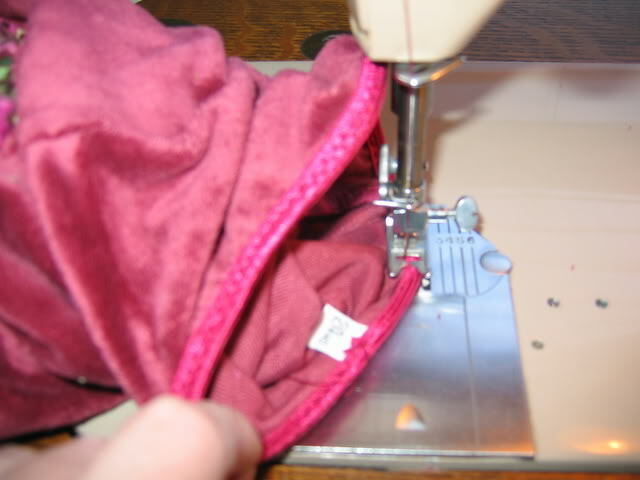 Then, stitch closed the opening in the waist. Now you’re ready to hem the ankles. When you’re all done, come share them in our Runway!